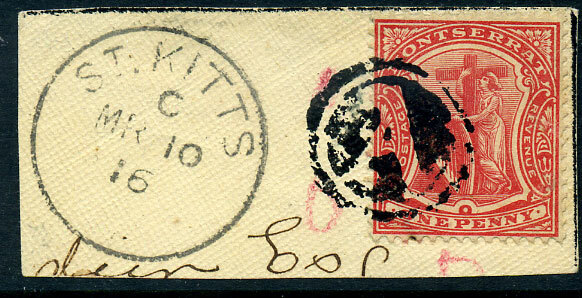 two full or fullish strikes on QV ½d, pair QV 1d (SG.47a, 48b) on mourning cover fragment. UNIQUE USE OF THE ANGUILLA "A" MAIL BAG SEAL? 1916 small mourning envelope piece mailed from Basseterre with ST. KITTS C/MR 10 16 cds with Montserrat 1d Badge (SG.36) isolated by small red crayon circles so as to identify as unacceptable postage within St. Kitts and boldly "killed" by "A" itaglio mailbag seal. Believed unique, the use of this mailbag seal not seen before, and "A" obviously suggests the possibility that it was prepared for sealed bags from Anguilla as it is almost certainly a mark of local origin.